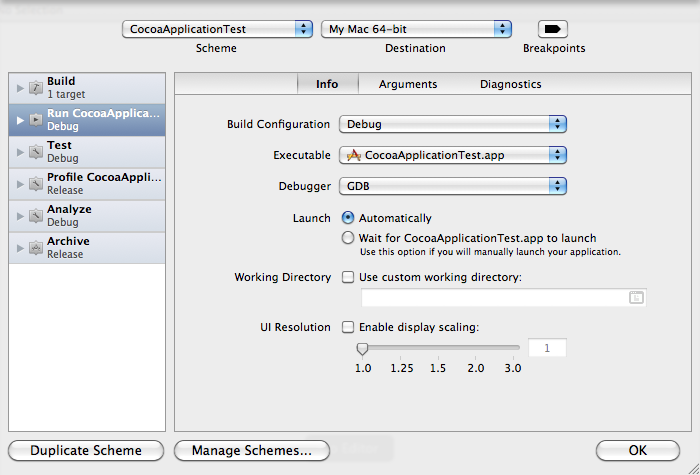 Where do you set the active build configuration in Xcode 4? You set the build configuration in the scheme editor. To open the scheme editor, choose Edit Scheme from the Scheme pop-up menu in the project window toolbar. Use the scheme editor to choose the build configuration to use when running, testing, profiling, analyzing, and archiving your project. You’ll change the build configuration most often for running. To change the build configuration Xcode uses when running your program, select Run from the list on the left side of the scheme editor. Choose a build configuration from the Build Configuration menu. Thank you so much . . You saved me . I was searching for this from 3 days like hell . Finally got to know here . Even Apple has no documentation for this , very stupid . By using this i can launch external application. But how to launch and perform automation testing on external application if i have .app or .ipa. I would like to help you, but your question has nothing to do with setting the active build configuration for an Xcode project. Click the Contact link on the left side of the page to send me an email. You might also want to post your question on a Mac development message board. Apple has two developer forums, one free and one for paid developers. Stack Overflow and Mac Rumors also have boards that deal with Mac and iOS development. Thanks a lot man, your post saved me a lot of time ! !